From birch to maple to ash to bamboo, wood baseball bats are expanding their options. With 450+ options on JustBats.com, we know a thing or two about these splendid splinters. After reviewing the 7 Best 2017 wood bats last year, JustBats.com gathered customer feedback, reviews from players, and input from coaches to name the six (6) best 2018 wood bats. Maple is dense wood that gives a bat a heavier feel. Ash is the lightest type of wood bat and offers an excellent combination of strength and forgiveness. Birch is a good blend of the hard-hitting surface with a lighter, more flexible feel. Bamboo is the most durable design on the market, but not always legal. Approximate 2 1/2 inch barrel diameter and (-3) length to weight. Standard handle offers better control. MLB grade maple wood provides unmatched durability. Bone rubbed to compress wood and make it denser. 2 9/16 inch barrel diameter and approximate (-3) length to weight. Recommended for adults with experience hitting wood bats. A cupped end helps improve weight distribution and durability. BBCOR certification for NCAA and NFHS play. Glass fiber reinforced taper and handle for long-lasting performance. Recommend for both contact hitters and power hitters. Read more about Victus bats. Approximate (-3) length to weight. Recommend for contact hitters and the perfect option for players transitioning from metal to wood. MLB ash wood provides the best flex in the business. EXOARMOR doubles the surface hardness for superior power, better feel, and unbeatable sound. Approximate 2 5/8 inch barrel diameter and (-2) to (-3) length to weight. Slightly end loaded swing weight. Recommended for power hitters and approved for High School and Collegiate play. New rubberized handle reduces negative feedback to the hands. Have you had a chance to swing or see any of these 2018 wood bats? 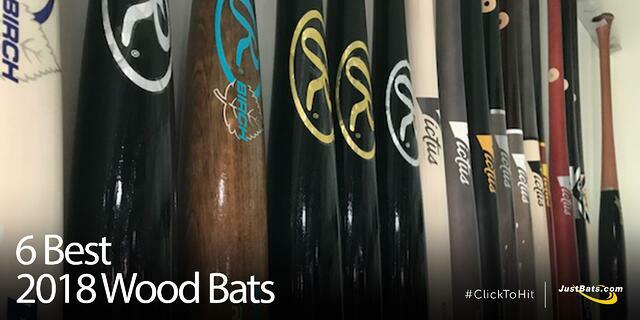 What do you think is the best wood bat? If you have any additional questions about wood bats, give our Customer Coaches a call at (866) 321-2287, shoot them an email at support@justbats.com, or click here to live chat! Remember, we're here for you from click to hit!